What do old polls show about the next election? I wrote a post last year about old opinion polls and how well they predict future elections. It compared election results with polls taken 18 months after the previous election, and also compared polls taken two years before an election to the result of that election. It’s now coming up to two years before the next election and the second part of my post has got a bit of attention. John Rentoul in the Independent on Sunday argued that this kind of analysis is all well and good but we shouldn’t pay too much attention to where the polls are at the moment – there are too many unpredictable events that will change things over the next two years, and what matters is how the parties respond to them. 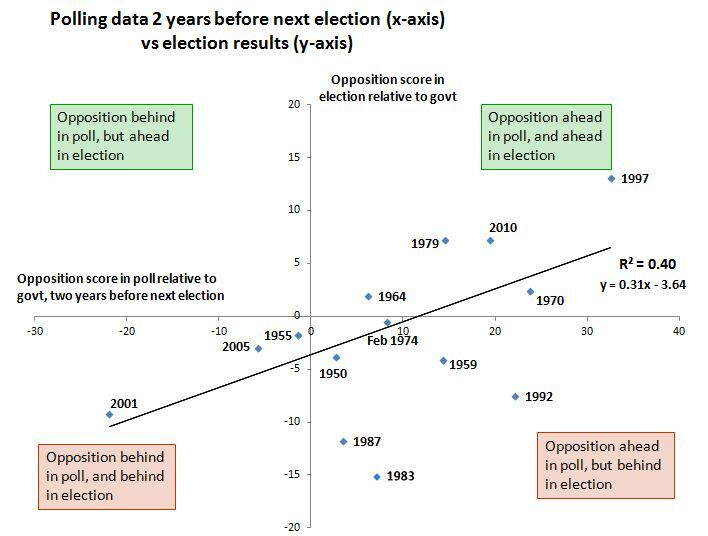 On Labour Uncut, Rob Marchant focused on the implications of the “two years before the next election” chart (below) and concluded that Labour is on the border between being on course to win in 2015 or not. The “two years out” data do suggest, as Marchant says, that Labour’s current 11pt lead is about on the cusp of where an opposition needs to be if it’s to have most votes at the election. Only once – ’64 – has an opposition won when it’s been ahead by less than 10pts at this time. But Rentoul is right that current polls can only take us so far: indeed the regression showed a 40% correlation, not a perfect prediction. Events, and the parties’ reactions to them – politics – will do most of the shaping of what happens, and whether Labour’s lead goes up or down. This is probably about as far as we can get looking just at overall national voting intent and past elections. But we can learn more by digging a bit deeper into where Labour’s lead came from. About 15% of Labour’s current support is from people who voted Lib Dem in 2010*. It was their move to Labour in late 2010 that gave Labour a polling lead which it has kept pretty much consistently (except a brief period in early 2012). The fact these voters have largely stayed with Labour for two years suggests their support is fairly stable. But who knows what they will do when the Lib Dems start stepping up an election campaign, or if Clegg is dropped and the Lib Dems start trying to present a clean slate. On the other hand, part of Labour’s lead also comes from the fall in support for the Tories. Of those who voted Tory in 2010, around a third wouldn’t do so again. About one in seven of these defectors have gone to Labour, so doing double damage to the Tories’ relative standing, but about two thirds of Tory defectors are now undecided or have gone to UKIP. I mention these because I expect they’ll be the targets for Tory anti-Labour negative campaigning over the next two years: come back to us or Labour will be back. This group makes up about 8% of the electorate. Just by winning them back, the Tories would hugely narrow the election, without even touching the fillip Labour got from Lib Dem defectors. I mention all this not to try to make a case for electoral determinism. But the lessons of past elections do have their uses. One crucial point from the chart above is that gaps between governments and oppositions in mid-term polls pretty much always narrow by the time the election comes round. Knowing this, it makes sense to start asking how the polls might narrow this time. Labour’s gains from the Lib Dems have looked pretty solid for a while now, but the defections from the Tories might be less so. What these voters decide to do between now and 2015 will be determined by politics. * The numbers here and below are ones I’ve worked out from combining a few polls. For an example of the kind of numbers I was starting with, I find ComRes’s polls (eg this Dec poll) to be handy as they show most of the tables and crosstabs so you don’t need to fiddle with the numbers too much to get what you need. This entry was posted on Saturday, January 12th, 2013 at 18:39	and is filed under Historical polls, Politics. You can follow any responses to this entry through the RSS 2.0 feed. Both comments and pings are currently closed.